North Uist, Dun Olavat. 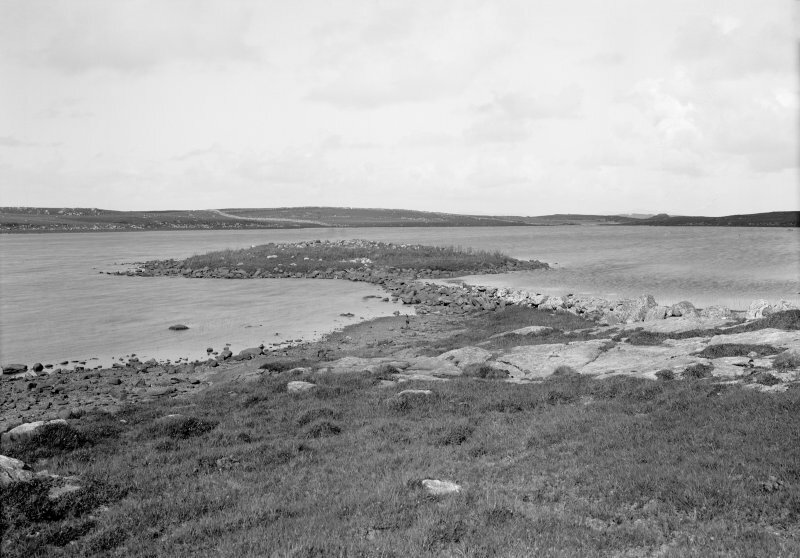 General view from SW.
(NF 7468 7532) In Loch Olavat is the site of a dun, with a causeway which still remains in good condition. 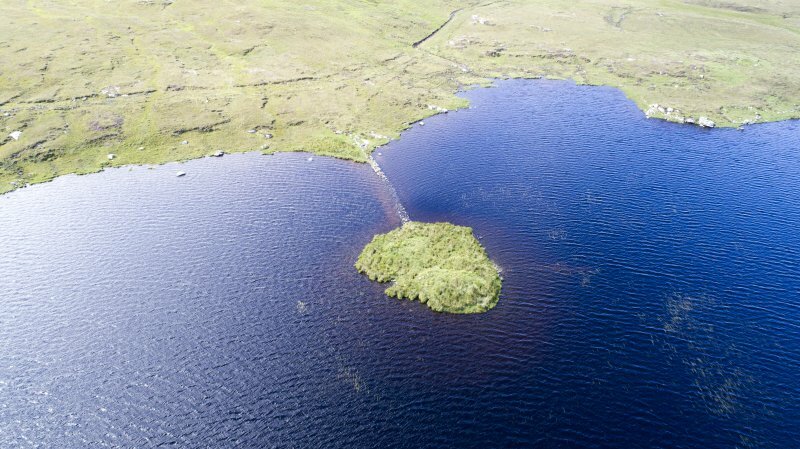 The islet is known as 'Eileann Domhnuill a' Spionnaidh' and has evidently been walled round. Partial excavation of the summit yielded little result beyond confirming that the island was at one time occupied by a fort now obscured by the foundations of two secondary buildings placed side by side. These overlay a thick deposit of kitchen-midden ashes, while similar remains mixed with small potsherds were found near the centre of the island 12 to 17ins beneath the later floor. Here were found pottery, a saddle- quern, and a stone pounder. All traces of the original dun have been obliterated by the two later buildings which still stand up to 0.4m high. There is little evidence of walling round the island, the name of which could not be confirmed. Visited by OS (JTT) 19 June 1964. 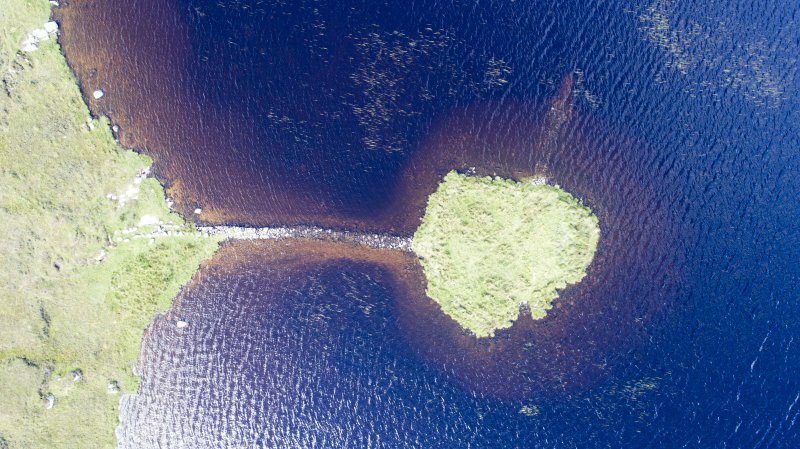 Eilean Domhnuill a Spionnaidh is joined to the shore by a substantial causeway and was previously recorded as an island dun. Excavation showed the idea of a central stone structure or dun to be illusory and instead showed indications of a much smaller building, possibly one of several on the island. The pottery from the site is clearly neolithic and very similar to material from Eilean an Tighe (NF87SW 1, q.v.). Dun Olavat, Eilean Domhnuill an Spionnaidh, Loch Olavat, Griminish, North Uist. A further season of excavations was carried out in the summer of 1988. The area of excavation being enlarged to encompass most of the islet. The upper structures conventionally regarded as of post-medieval date seem likely instead to represent the final phase of the neolithic occupation. Their associated external deposits yielded saddle querns stacked in situ and pottery which, while of coarser fabric than other types on the site, retained neolithic forms. These structures were built above and had disturbed a single, oval house structure defined by boulder alignments, postholes and a central hearth. This in turn overlay and truncated a more substantial wall which appears to have formed part of a rectilinear structure identical in wall construction to the uppermost houses. 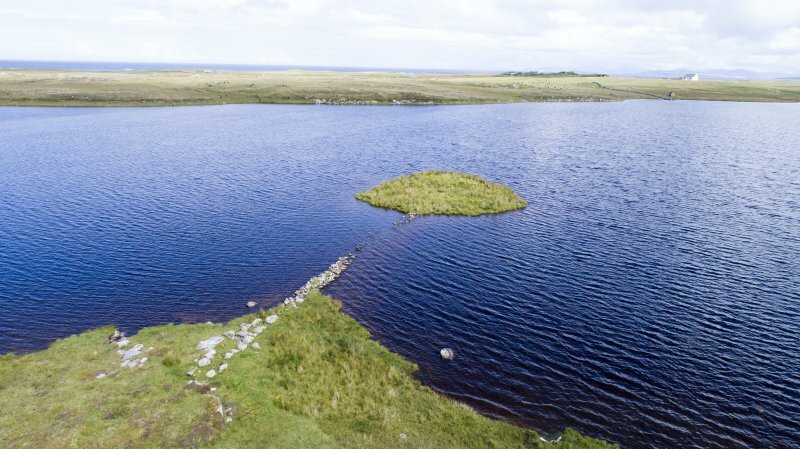 In all of these phases access to the island was by means of a substantial stone-built causeway which approached a roughly cobbled area on the islet. Below these structures were deposits of a lengthy and complex period of occupation when the islet was occupied by two adjacent structural foci of relatively flimsy construction which were subject to much alteration and rebuilding. The west structure was formed on its latest phase of a posthole arc (of which probably two thirds has been removed by erosion on the islet's edge) with no discernible internal features which overlie fragments of boulder alignments and cobbled areas with two successive paved hearths. In no single phase of this structure's development can a coherent floor plan be recovered because of a combination of continual disturbance in antiquity and erosion of the edge of the islet. The east structure presents similar problems, although it has been less badly eroded. This larger, oval structure was defined by boulder alignment and contained a succession of residual deposits, hearths and post-holes. The two structural foci were approached by an earlier phase of the same causeway which was lined by hurdle and palisade settings at least in the few metres of final approach to the structures. This causeway was shielded by cross-causeway palisade settings which were replaced at least twice during the life of the structures. Test excavations of the waterlogged deposits were carried out as a prepapration for full 'wetland' work next season. Wood preservation is good, with substantial pieces preserved including worked pieces, fence or palisade stakes and hurdle fragments. Other macro-plant and insect preservation was also demonstrated. Among the finds, as well as large quantities of early neolithic pottery dominated by Hebridean and Unstan forms, was a series of stone balls including one incised with herring-bone patterns and crudely carved concentric circles. The excavations were sponsored by the Russell Trust and the Royal Museums of Scotland. The deposits excavated in 1989 comprise Phases 5-11 on the site, represented by seven successive sub-rectangular house structures and associated middens. These houses were all badly robbed-out to foundation level and were defined by the limits of occupation material, fragments of walling, post-holes and substantial hearths. The lower, waterlogged levels have good timber preservation and the houses of Phases 9-11 have timber uprights forming parts of the walls, internal partitions and other features. One of the major features on the site this year was the entrance-way and facade constructed in Phase 11 (earliest so far excavated) and used, in modified form, until Phase 5. A timber causeway from the shore (represented by surviving timber uprights) led to an orthostatic facade revetting the islet-edge. A paved entrance, lined with orthostats, led through this facade into the interior where the successive houses were constructed. The contrast between the elaborate entrance construction and the much slighter house structures is striking. No less striking is the resemblance in plan and architecture of the entrance-way to those of contemporary chambered tombs. The facade was rebuilt after loch levels had risen and the upright timbers of a palisade were preserved behind the new facade. Traces of timber structure have already begun to emerge under the Phase 5-11 structures and will form the focus of the 1990 excavations. Finds from the site have continued to be plentiful. Several virtually complete pots of Hebridean, Unstan and Plain Bowl forms have been recovered in an assemblage which now comprises approximately 20,000 sherds. The lithic assemblage by contrast is impoverished. Other notable finds this year included a stone bead, stone axe, straw rope, wattlework hurdles and a rich sample of organic materials. Sponsors: National Museums of Scotland, Russell Trust. 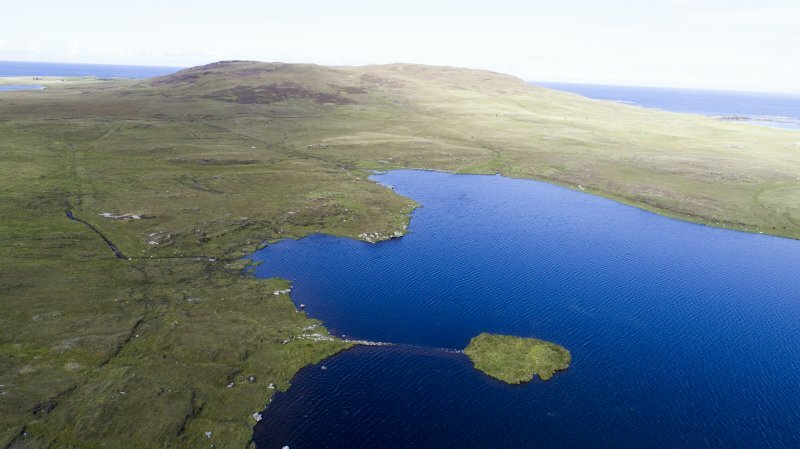 A one week underwater excavation was carried out in July in 1989 in Loch Olabhat off this site. 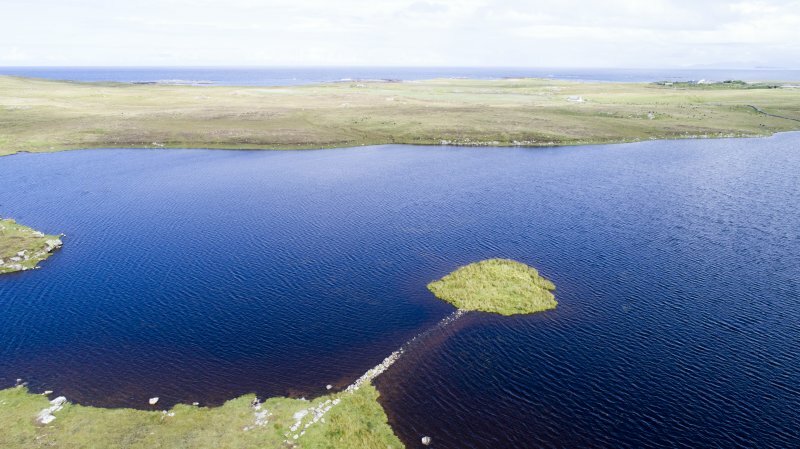 Armit's work (supra) showed that organic deposits were well preserved around the edge of the small island with evidence dating it to the Neolithic Period. The underwater excavation was conducted under the auspices of the Scottish Trust for Underwater Archaeology, to establish the extent of submerged deposits with a view to carrying out more substantial underwater work in the future. It was also hoped that the submerged excavation would contribute to the stratigraphical sequence previously established on the island. Prior to excavation a number of submerged features were observed. An earlier shoreline concentric to the shore of the existing island, and some ten metres out from it, suggests that the site was much larger in the past. 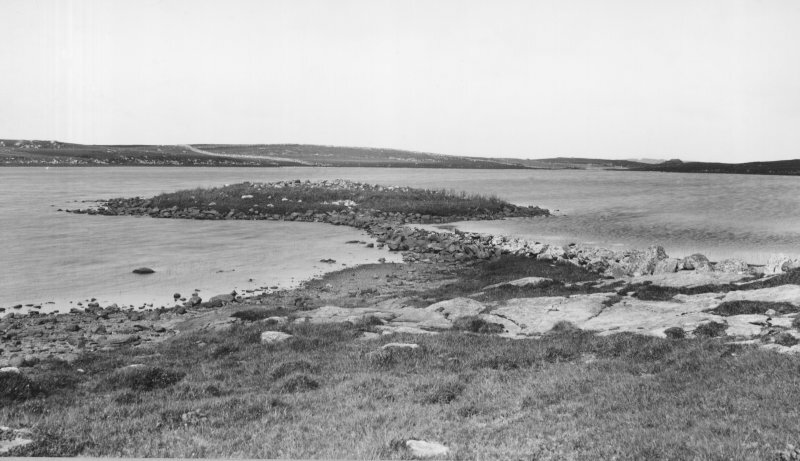 What appeared to be an arc of walling about five metres off the modern shoreline suggested the possible remains of submerged settlement structures. This wall was examined and at least six courses were uncovered embedded in the loch bed silts. The main thrust of the preliminary excavation was a two metre wide trench which was basically an extension of a previous land trench where organic deposits had been seen. The trench, more of a sondage, was 1.5m long and was excavated to a depth of about 1m. The upper layers in the trench consisted of redeposited hearth material substantially the same as that found in the shore excavation. Underlying this were various layers with a high organic content with the lowest layer excavated being almost completely organic consisting of straw, peat, bracken, ferns, twigs and other comminuted vegetation. It seems likely that the layers represent successive living floors in situ. The most striking aspect of the excavated area was the remains of about thirty apparently structural timbers of which many were clearly associated. They consisted of transverse timbers of approximately 5-15cm in diameter and at least two stakes or piles. Lying to the northeast of the timbers was a bundle of twigs with the bark still intact and shiny. They were all embedded in the straw-like organic deposit described above. Forward of the main trench, a narrow cutting was made to tie the underwater and shore excavations together. It was in this cutting that the remains of a well-made hurdle were discovered. This was cleaned up and recorded but, as it extended into the section, it was left for excavation at a later date. Finds from the underwater site included substantial fragments of pottery, well-preserved animal bone, a deposit of winkle shells, hazelnuts and coprolites. A small fragment of straw rope about 5 centimetres long was also discovered. Analysis of the exceptionally rich matrix in which these objects were found should prove very rewarding. 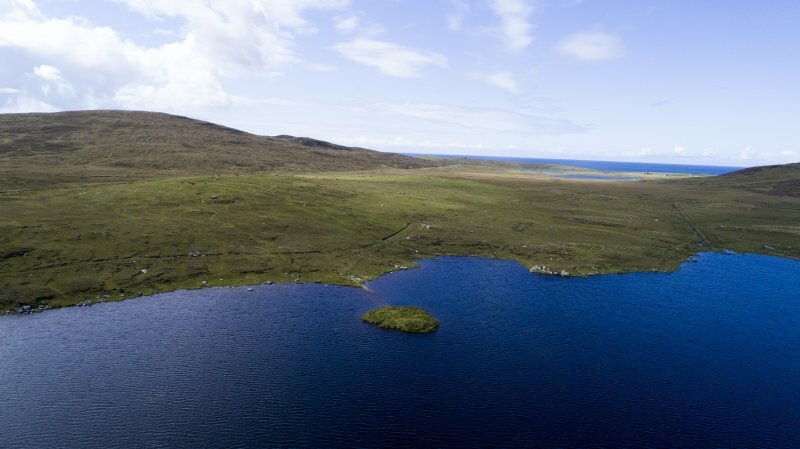 The early Neolithic date of this site, the range and preservation of dry and submerged finds, structures, and organic deposits in such a small area, and the assumed large size of the earliest island make this potentially one of the most productive and important sites in Scotland. 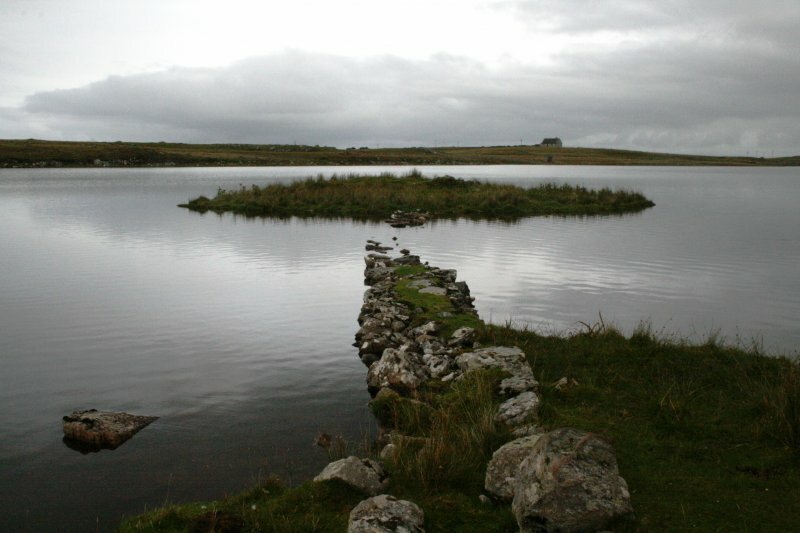 The island is approached by a substantial causeway that is partly submerged beneath the water level of the loch. At its S end, the causeway runs up onto an outcrop and gives the appearance of a stone faced boundary wall. Little trace of the buildings that were formerly visible on the island can now be seen. Visited by RCAHMS (ARG, SPH) 31 August 2009.